Jurassic World is the fourth entry in the Jurassic Park franchise. It takes place on the same island as the first movie but Jurassic Park has been renamed to Jurassic World for marketing reasons since people died in the events of the first film. Twenty-two years later the visitors of the park (and the audiences for which this movie is made) aren’t thrilled enough with regular dinosaurs anymore, so scientists in Jurassic World (and Hollywood script writers) have cooked up a new genetically engineered dino hybrid called Indominus Rex. The result is probably the most frightening dinosaur I’ve ever seen onscreen. Of course things go wrong and it inevitably goes on a killing spree. You know the routine. 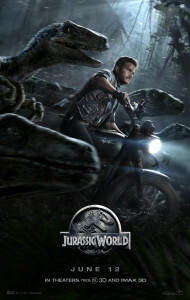 I rolled my eyes when I first saw Chris Pratt riding a motorcycle with the raptors in the trailer but it’s not exactly what it looks like. It’s handled nicely in the movie. All of the performances are “acceptable” to “good”. The established relationships between characters are believable but no relationship building happens on screen, and no connection is really established with the audience. As a result you never get super invested in them individually. Out of the characters that died I honestly only felt bad for one of them and that was mostly because of how they died and not necessarily that they died. Outside of the romance angle between Pratt and Bryce Dallas Howard, most of the stuff meant to evoke emotion or empathy involves the children. A lot of that could have been cut and the rest felt like it was there as a set-up for something else later. My biggest criticism of this movie is that people just didn’t seem scared enough outside of moments when they were in immediate danger. Judy Greer had the most emotional performance in the movie and she was not even on the island. I’m fine with this though. Ultimately (in a movie like this) every actor’s only job is to stay in character and not irritate the audience until it’s their turn to be eaten. Jurassic World doesn’t have the magic and chemistry of the first movie but it is entertaining and fun. That’s all I really need from a movie like this. The Indominus Rex is cool, the humor works surprisingly well, and the performances are good. I’m not sure that I would recommend taking younger kids to see this because of the blood and intense action (unless you think that they can handle it). Fans of the previous movies or anyone just looking to escape for a couple of hours will be entertained. It’s certainly a movie that I would go see again.